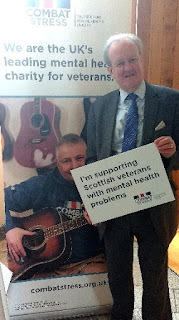 MSP Stewart Stevenson has pledged his support for Scottish veterans with mental health conditions at the Scottish Parliament today. The Banffshire and Buchan Coast politician met with employees from veterans’ mental health charity Combat Stress to hear more about their work to support veterans living in Scotland rebuild their lives. Combat Stress is the UK’s leading mental health charity for veterans and provides free specialist clinical treatment to ex-servicemen and women across the UK with mental health problems. The charity treats conditions including Post-Traumatic Stress Disorder (PTSD), depression and anxiety. “Our veterans are an asset to Scotland and the work Combat Stress does to support veterans in Banffshire and Buchan Coast and across the country is invaluable. “It is vital that all veterans have access to the specialist support that they need for conditions such as PTSD, depression and anxiety. “I encourage all those who need support to contact organisations such as Combat Stress at the earliest opportunity. “The Scottish Government’s support for veterans, including the Scottish Veterans Fund, is welcome, but the 71% increase in referrals that we experienced over the past five years illustrates the rising demand for our work. A branch of the Royal Bank of Scotland is expected to shut its doors in seven months in a North East town. In a letter to Banffshire and Buchan Coast MSP Stewart Stevenson, the company said the move was being taken as a result of the “rapidly changing” way in which customers were now doing their banking. It means the current Royal Bank of Scotland Branch in Buckie will close on October 4th this year. The decision by the company comes after Clydesdale Bank also revealed it would be shutting a number of branches earlier this year. “We are communicating with our customers affected by the closure and proactively contacting vulnerable and regular branch customers. “We have listened closely to feedback from local communities and have extended the time between announcing our decision and the branch closure to six months. “We know that not all of our customers are comfortable and familiar with using online or mobile banking, so we have created a new specialist taskforce of TechXperts who will be dedicated to supporting our customers with training and support with digital skills. “I am disappointed to hear the Buckie branch of the Royal Bank is to close later this year. “While I understand more and more people are doing their banking online, local branches are vital for rural areas. Progress made by Banff Academy on a recent inspection has been welcomed by MSP Stewart Stevenson. The report was released this week after a visit by an Inspector from Education Scotland. It says the school has taken some “important steps” to improve its overall performance but says there is still more work to be done. “While it is clear there are still steps which need to be taken by the Academy, I am pleased the work that has been undertaken by the head teacher, staff and pupils has helped to move it in the right direction. “The communication between those who work there and the students means there is a continued dialogue and open-mindedness in discussing what else can be done to make marked changes and drive the school forward. 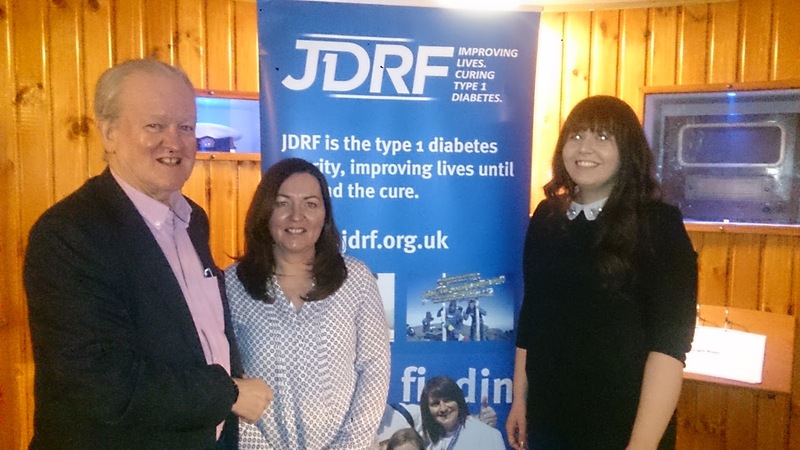 Banffshire & Buchan Coast MSP Stewart Stevenson attended the diabetes “Discovery Day” held in Fraserburgh’s Museum of Scottish Lighthouses. The Juvenile Diabetes Research Foundation (JDRF) is hosting a number of type 1 discovery days across Scotland between February and June which are open events where people can come along to find out more about type 1 research, hear inspirational talks and meet others affected by the condition. “It was good to meet with some of the staff and fundraisers of JDRF, the type 1 diabetes charity, at their Discovery Day in Fraserburgh. I was very interested to hear of the experiences of some of the individuals and families affected by this condition. 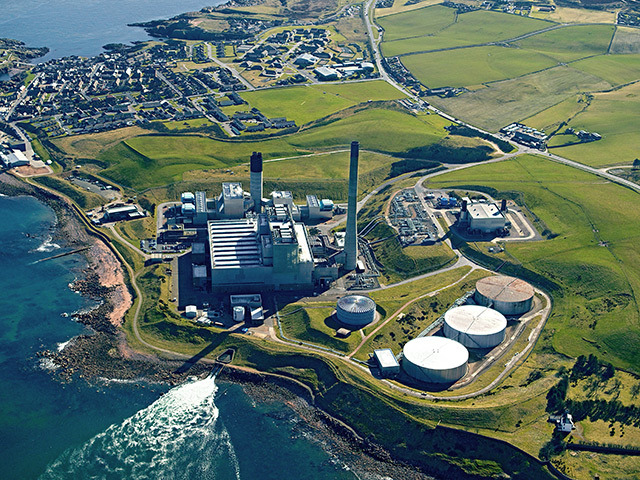 Scottish Energy Minister Paul Wheelhouse has confirmed no jobs are at risk of redundancy from Peterhead Power Station. It comes as the facility’s operator SSE reviews future options for Peterhead over the coming months. However, it is not clear how long the jobs will be protected at the site. Mr Stevenson made the enquiry as a result of an announcement that Peterhead Power Station failed to secure a deal to supply capacity to the UK grid in the recent capacity market auction. Figures previously revealed the growing disparities in costs of generation charges as Peterhead could face paying an estimated £19.60 per kilowatt compared to a gas fired power station in Kent which would pay only £1.75. Stewart Stevenson, MSP for Banffshire and Buchan Coast, asked the Scottish Government what impact the review by SSE would have for jobs and the local economy. “SSE has said it will be reviewing future options for Peterhead over the coming months and will engage with all stakeholders. “During the review the current operations at the station, and the workforce of 90 personnel will not be affected. Mr Wheelhouse also said Peterhead had “great potential” to demonstrate Carbon Capture and Storage (CCS). He said the Scottish Government “deeply regret” the withdrawal of support for CCS. The politician added such an investment could provide “considerable” employment opportunities locally. It’s understood Scottish Minister and officials are meeting regularly with representative of SSE. “Peterhead has already been grossly disadvantaged by the Capacity Market Auction. “The facility also lost out on funding from the Tories but I am glad that as this review is completed, jobs will not be at risk. The Scottish Government has given stronger assurances over action being taken to set a fisheries’ landings target. Banffshire and Buchan Coast MSP Stewart Stevenson asked the Cabinet Secretary for the Rural Economy and Connectivity Fergus Ewing what impact the move could have on fishing communities. Work has been ongoing throughout the fishing industry to encourage voluntary landings in the increase of sea fish. A particular focus has been placed on the number of pelagic sea fish being landed outwith Scotland. In the recently completed winter fishing season, the Government sought a voluntary increase in landings of mackerel into Scotland. Mr Stevenson called on Mr Ewing to explain what impact the voluntary increase in landings would have and what actions were currently being taken to implement it. He was told there had been “very little progress” in the most recent fishing season with the number of pelagic fish landed into Scotland and overseas remaining “broadly the same” as in recent years. “The Government is now considering what further steps might be appropriate to establish a Scottish landings target for Scottish fishing vessels, and in this is consulting with a wide range of relevant representatives. “I welcome the recent efforts by the Scottish Government to increase the volume in landings in the most recent winter fishing season. “An increase in landings would further support businesses in the North East and could boost exports as well as jobs. “It is reassuring to hear from the Cabinet Secretary that the Scottish Government is looking at what further steps might be appropriate to establish a target. Banffshire & Buchan Coast MSP, Stewart Stevenson, has called for increasing awareness and research for endometriosis in a recent Parliamentary debate. Mr Stevenson backed increasing public awareness of the disease and focused on the impact endometriosis has on the lives of women suffering from the disease and their families. He noted a lack of public awareness about the disease and the urgent need to find a cure. The debate brought to light personal stories of women living with endometriosis in Scotland and produced a consensus that health professionals, governments and citizens should be encouraged to educate themselves about the disease as part of Endometriosis Awareness Week, starting 6th of March. “Endometriosis is a destructive and currently incurable disease – but it remains the second most common gynaecological condition in Scotland. One in ten women suffers from this condition across the UK – that’s huge number of women suffering. “It’s critical that women living with this condition have speedy access to diagnosis and the best treatment available. Quick and appropriate treatment is essential in promoting of better quality of life for these women and their families. Banffshire and Buchan Coast MSP Stewart Stevenson has called for assurances the North East’s fishing industry will not be made “expendable” by the UK Government as it was in the 1970s. Mr Stevenson made the call to the Minister for Rural Economy and Connectivity Fergus Ewing after a recently leaked memo implied the fishing industry was a “medium priority” in negotiations to exit the European Union. “The memo, if it is genuine, serves only to increase my concern that, once again, the UK indicated why it is vital that Scotland be fully involved in all negotiations relating to Scotland’s future in Europe. In response Mr Stevenson asked if there had been any guarantees from the UK Government about the funding levels that support fishing communities. He was told by the Minister that he had, at a meeting last month, he asked for the UK Government to affirm its pledges on EU funding of £500million a year for the rural economy. Mr Ewing said since the referendum to exit the European Union, there had been “radio silence” on support for the fishing industry. He said the Scottish Government would “fight and fight again” for a fair deal. “Yet again we have no clear assurances from the UK Government on how it will support the fishing industry during the negotiations to exit the European Union. “Rather, the only information we can get in the public domain about what support is being provided, merely shows how low down the rung this vital sector appears to be to the UK Government. “David Mundell has already refused to promise fishing powers would return to Scotland following our exit from the European Union despite the fact we were told power would be automatically returned to Holyrood – a move which ignores that Scotland have had responsibility over agriculture and fishing since day one. Figures have revealed a North East power station pays some of the highest charges for generators in the UK. While Peterhead Power Station could pay generation charges of £19.60 per kilowatt a gas fired power station in Kent would pay only £1.75 per kilowatt. Banffshire and Buchan Coast MSP Stewart Stevenson asked the Scottish Minster for Business, Innovation and Energy what assessment had been made of the higher transmission entry capacity costs faced by Peterhead power station. It comes after the recent capacity market auction, which it is believed to have prevented the facility from securing a deal to supply capacity to the UK grid, because of its location. Mr Wheelhouse revealed estimates which showed that Peterhead would pay generation transmission charges of £19.60 per kilowatt during the period of 2017-18. By comparison, a gas fired power station in Kent was shown to pay £1.75 per kilowatt. “Clearly this places Peterhead at a disadvantage in any auction model. The Capacity Market Auction (CPA) awards funding to electricity generators in return for guaranteeing supplies to the national grid at times of potential shortages. “Peterhead has been grossly disadvantaged by the CPA because of its location. “The facility has already lost out on funding from the Tories and now we can see the huge differences in what facilities across the UK will pay in terms of transmission charges. “I am astonished Peterhead power station will faces estimated costs of £19.60 but a similar site in Kent would pay just £1.75 all because of our location. “It is simply being made impossible for Scotland and the North East to develop capacity when we face these disparities." Banffshire and Buchan Coast MSP Stewart Stevenson has welcomed the Seatbelts on School Transport (Scotland) bill as it makes its first step through the legislative process. The SNP MSP has campaigned tirelessly for years in support of the issue after feedback from constituents. He has previously raised the issue of stricter legislation around seatbelts and school bus safety. Earlier today his colleague Gillian Martin, who represents Aberdeenshire East, met with pupils from Cuiken Primary School in Midlothian, a local authority area, where children have already been well-educated on buckling up on the journey to and from school. Mr Stevenson, a former Transport Minister for the Scottish Government, has worked hard to bring issues of school bus safety to the forefront of politics and he has been a long-time supporter of his constituent Ron Beatty who campaigned for fresh safety provisions after his granddaughter was left with life-changing injuries more than a decade ago. “I welcome the Seatbelts for School Transport (Scotland) Bill beginning its first step through parliament. “This work is incredibly important in ensuring the safety of our youngsters as they make their way from home to school.